The former station approach road has been extended along the trackbed and platform running into a small car park. The station building stood on stone blocks with steps in the centre down to platform level. The stone blocks are still there as are the steps which, as before, are the access point to the main line platforms. 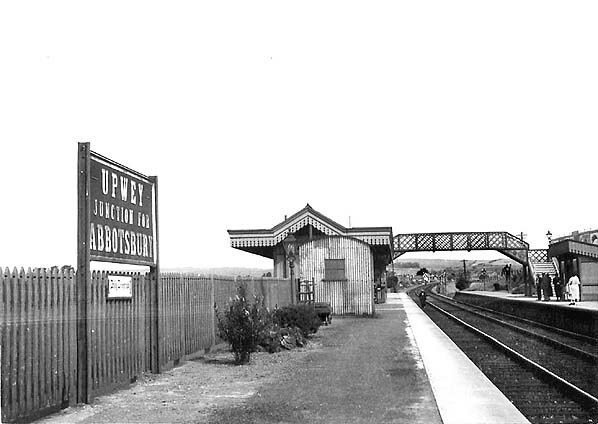 Notes: When the Abbotsbury branch opened on 9 November 1885, the new station at Upwey Junction was not ready, so passengers for the branch had to travel to the original Upwey station from where they were taken by horse-drawn carriage to Broadway station (ultimately known as Upwey) to join a Weymouth - Abbotsbury train. 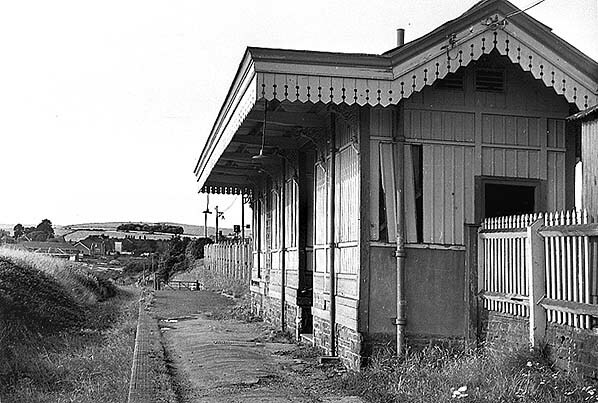 The new Upwey Junction station eventually opened a little over five months later on 19 April 1886, the original Upwey station closed on the same day. The main line had two facing platforms spanned by a lattice footbridge. The branch had a single platform on the up side of the line immediately behind the down main line platform, but at a lower level. The branch line was steeply graded through the station; at its south end the platform was about a foot lower than the main line platform, but at the north end it was about four feet lower before the ramp. 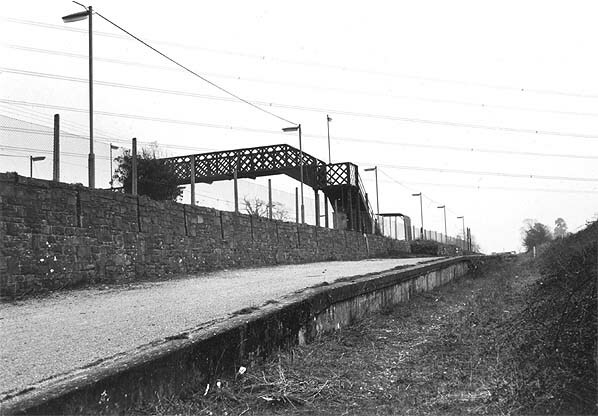 Because of the difference in height, there was a fence along the back of the mainline platform to prevent accidents. The down main line platform and the branch platform shared a single timber building with a hipped roof, but on the branch side it stood on several courses of stone blocks because of the difference in level, with steps down to the platform. The building was faced with vertical timber weatherboarding. There was a canopy protecting both platforms, with a fretted valance that followed the line of the hipped roof around the ends of the building. The up main line platform had a smaller timber waiting shelter with a sloping roof and a narrow canopy with a deep valance. The junction was controlled by a signal box at the south end of the up platform. The station did not handle goods traffic because of its position, all goods being dealt with at Broadway which was less than half-a-mile away. The station did, however, handle some parcels, and a corrugated iron shed was provided for this purpose on the down platform at the south end of the station building. After closure of the branch to passenger traffic on 1 December 1952, the line to Upwey – the first station on the branch, originally known as Broadway - remained open for goods traffic. With only the main line platforms in use, the former junction station was renamed Upwey & Broadwey. The branch platform remained in good condition during this period although devoid of nameboards. It was used as the main access point to the main line platforms. 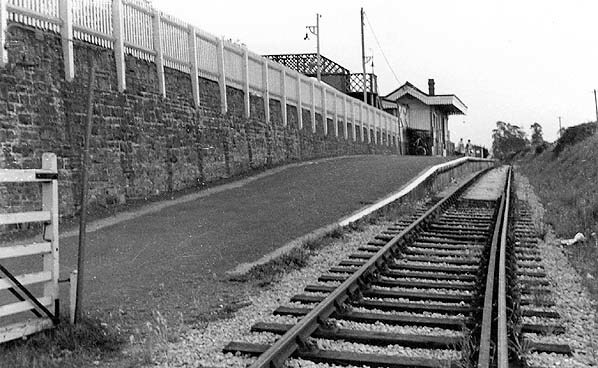 The track through the station was re-laid with new ballast and concrete sleepers in the late 1950s. Upwey Goods closed on 1 January 1962 and the track was lifted in 1965. The junction was finally severed on 6 September 1966 but the signal box remained open until 1 March 1970. All of the station buildings were removed, probably in the late 1960s, and were replaced with two bus shelters. The station name was once again changed to Upwey on 12 October 1980. Prior to the extension of electrification from Bournemouth to Weymouth in 1988 the station was refurbished in trademark Network SouthEast colours with red lighting poles, station benches and monitor screens for train arrivals. Rubble from the rebuilt Weymouth station was used to fill in the former branch line trackbed up to platform level for use as a car park, and the approach road was extended into it. Weymouth via Bath Spa, Westbury and Yeovil Pen Mill. Some services originate from Westbury, with passengers having to change to reach Bristol. Services are operated by Class 150, Class 153 or Class 158 diesel multiple units. In past years on summer Saturdays, Class 31 locomotives and Mk.2 coaching stock have been hired from FM Rail to cater for extra passengers and holidaymakers, but the demise of the charter company has seen this operation cease, at least for the time being. An accident occurred on 23 January 1894 involving the derailment of an Armstrong tender 0-6-0 locomotive when the train was on the tight curve between Upwey Junction and Upwey stations; this revealed that the curve was sharper than had been indicated in the official plans. A check rail was fitted and a ban introduced on six-coupled locomotives that nominally lasted until the remaining goods spur was reduced to a siding. This change of rules, ironically, meant that in later years these engines could be used by British Railways to service Upwey goods yard after the closure to passengers, even though the only part of the line operational at this point was the curve that had caused the problems. In the meantime this ban left the motive power duties on the line to other designs, notably the 0-4-2Ts which ran for many years. The '517' class gave way to the '14xx' class which were used for passenger and goods traffic until closure. reinstated in 1905 only to be withdrawn again a few years later. It was again reinstated in 1933, lasting until at least 1938. The 1902 Bradshaw shows five trains in each direction on weekdays. As with many branch lines, more convenient road transport and the introduction of motor cars and rural bus services would eventually lead to an irreversible decline in passenger numbers. Early in the twentieth century the GWR reduced maintenance and wage costs by installing ground-frames to replace signal boxes. In 1905, GWR steam rail-motors were tried on the line. 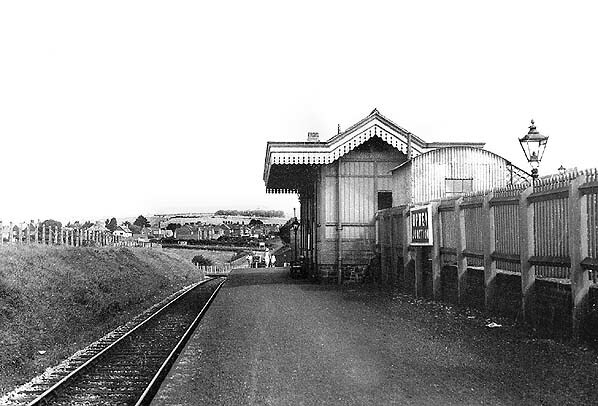 In conjunction with the new rail-motor service, Radipole Halt was opened on the main line between Weymouth and Upwey Junction on 1 July 1905 and Coryates Halt was added to the branch between Broadway and Portesham on 1 May 1906. The rail-motors were intended to stimulate traffic on branch lines, where small and cheap platforms could be built to serve small traffic sources. Unfortunately the lightweight rail-motors could not cope with pulling trailers on hilly lines. After a few years, they were converted into auto-coaches, and the power units were scrapped. Push-and-pull auto trains offered most of the benefits of rail-motor, but because they were operated by 'proper' locomotives they were much more flexible in operation and easier to maintain. The locomotive remained coupled to the carriages and pulled them to Abbotsbury and then pushed them back to Weymouth. Tickets from Michael Stewart, GWR timetable and BR WR working timetable Chris Totty. Route map drawn by Alan Young. Looking north from Upwey Junction footbridge c1910. The Abbotsbury branch platform is seen on the left. The line turns very sharply to the west to reach Upwey station in less than half-a-mile. Following an accident on the curve in 1894 a ban on six-coupled locomotives (i.e. with three pairs of driving wheels connected together by coupling rods) was imposed until the line was closed to passengers. A check rail was also fitted. 1902 1:2,500 OS map. The Abbotsbury branch and the up main line shared a platform, but there was a fence separating the two sides which is clearly seen on this map. 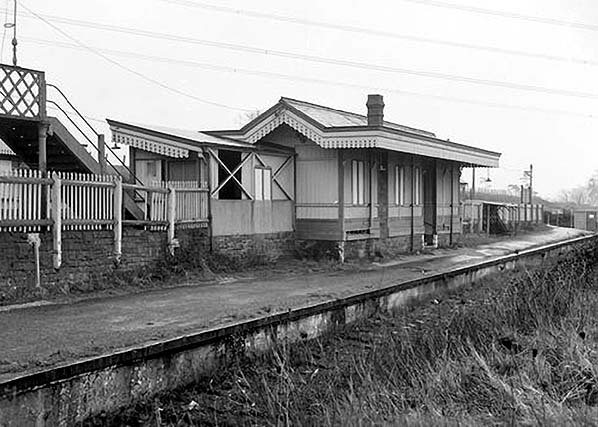 Although the branch line closed completely on 1 January 1962 the signal box, seen to the south of the station on the down side, remained in use until 1 March 1970. 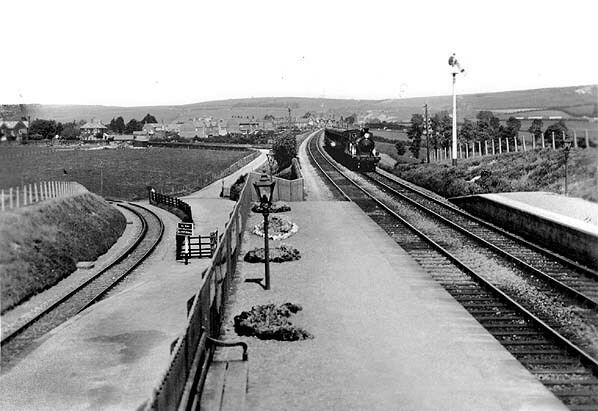 Upwey Junction station looking north along the up platform c1930s. The station building spans both platforms and is the only access point between them, as the branch platform is at a lower level. Upwey Junction station looking north c1950. The difference in levels between the two platforms is evident, with the west side of the platform building standing on several courses of stone blocks. The line can be seen sloping steeply towards the end of the platform. 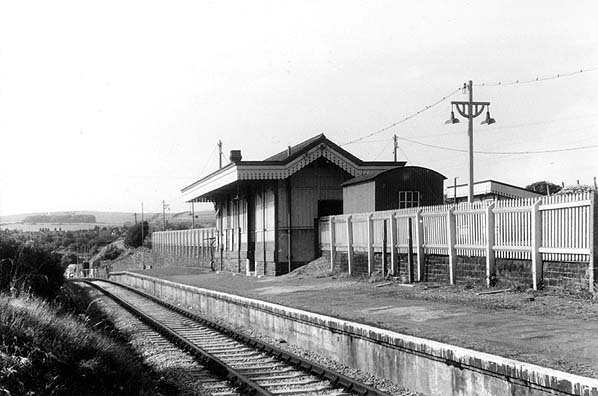 The gradient of the line is even more evident in this 1950s view looking south after closure of the branch. Note the check rail on the approach to the sharp curve that was fitted after the 1894 accident. The original GWR oil lamps, seen in the picture above, have now been replaced with electric lights. 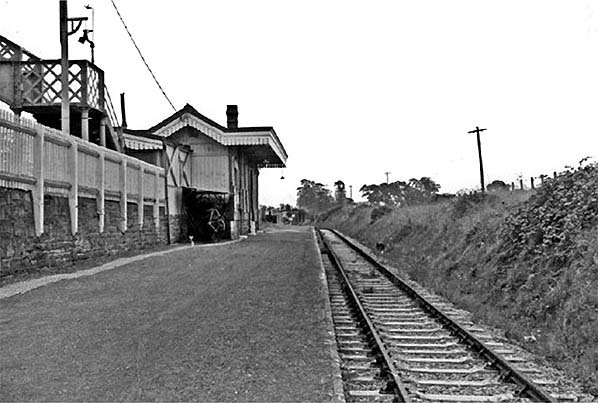 The former branch platform at Upwey Junction, looking south in 1959. After closure of the branch the station was renamed Upwey & Broadwey. Note that the track has been re-laid with new ballast and concrete sleepers, and the check rail has been removed. Upwey station looking north in July 1961. The new concrete sleepers stop at the end of the platform (also seen in the 1950s picture above). Within seven months the line would close completely, by which date the track had been re-laid through to Upwey station! Nearly 10 years after closure the station remains in good condition, although now devoid of signs. 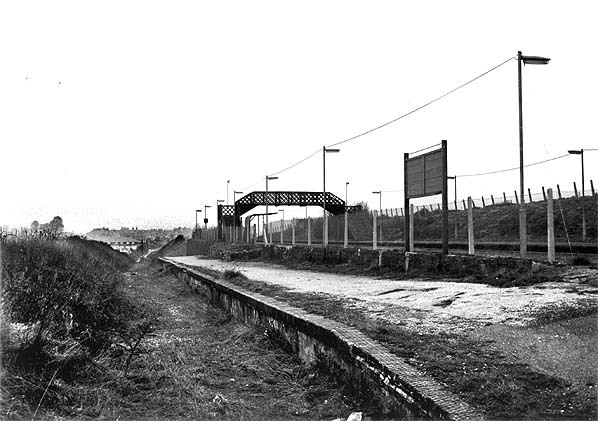 The branch platform during track-lifting in 1965. Upwey Junction station looking south along the branch platform c. late 1960s. The building is now beginning to suffer from lack of maintenance even though the other side of the building is still in use. 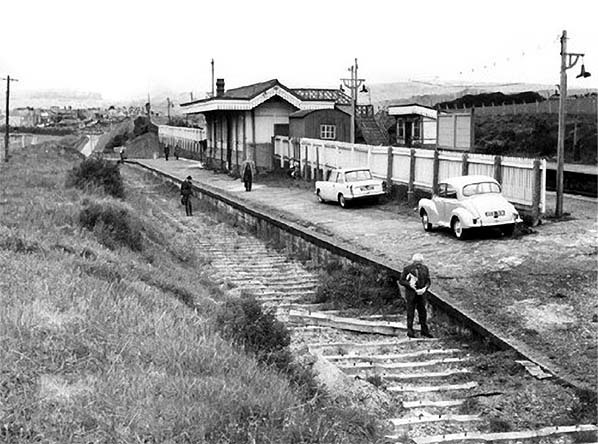 The branch platform at Upwey Junction in the late 1960s. Looking north at the branch platform at Upwey Junction in August 1978. 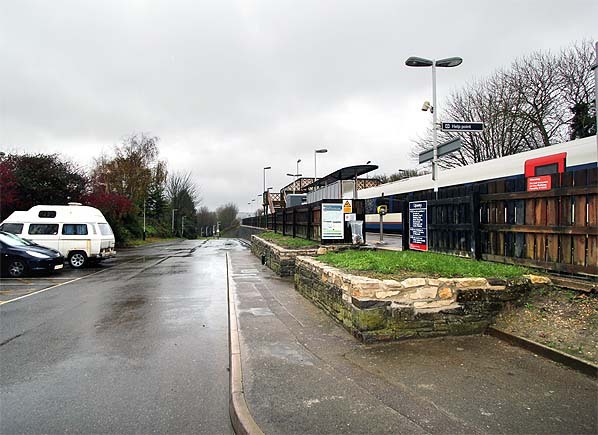 All of the station buildings have now been demolished and replaced with bus shelters on the main line platforms. The station lighting has been upgraded for a second time. Looking south at the branch platform at Upwey Junction in August 1978. Looking north at the site of the Upwey Junction branch platform in November 2012. The base of the west side of the platform building is still there, including the opening where there were steps down onto the platform. There are still steps there but they now give access to the road that runs through the site of the branch platform. The platform lighting has been upgraded for a third time.